Progressive is “comfortable” with its 7.5 percent margin on its insurance business, and seems to consider rates the main lever to manage future auto insurance costs, CEO Glenn Renwick indicated this week to investors. That could mean good news for collision repairers, both in the acknowledgement of raising rates to get out ahead of cost increases — such as buying a bunch of gear to fix advanced auto body materials — and in the apparent absence of plans for the kind of tighter claims handling Allstate said Tuesday it plans. Analysts on a conference call Thursday with Renwick and other top executives tried to reconcile Progressive’s milder statistics on miles driven and claims frequency with those announced by Allstate earlier this week. Allstate blamed the increase in miles driven — particularly on the interstates — and newer vehicles for driving claim frequency and severity to the point where its auto insurance brands lost $111 million between April and June. Progressive’s personal lines, which is 92 percent autos and 8 percent random vehicles like RVs and motorcycles, made $290 million last quarter (see quarterly report). CEO Glenn Renwick said Thursday that Progressive’s auto claims frequency results were closer to Property Casualty Insurers Association data — and even more favorable than PCI’s — than Allstate’s. 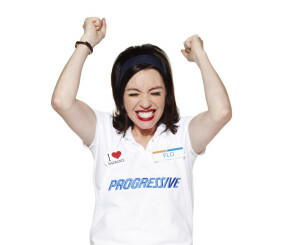 Progressive saw a 1-2 percent increase in the quarter, while Allstate was closer to 7 percent. However, while acknowledging both are large insurers with demographic overlaps, he pointed out the “mix differences” which might exist between the two insurers’ customers. Renwick also indicated his customers might not be driving as much as Allstate’s, saying Progressive saw a “reasonably constant” increase in miles driven before a July uptick. (Which wouldn’t have been in the second quarter anyway). When they do drive, they might be taking different types of trips than Allstate’s, though both insurers’ descriptions of the miles they’re seeing aren’t mutually exclusive. Allstate reported interstate driving was on the rise, contributing to higher crash severity, while Renwick reported an increase in single nonstop trips of 15 miles or more were growing. Renwick also said that Progressive saw a frequency uptick coming and had already raised auto premiums last year in preparation. Premiums in the second quarter were 4 percent higher than last year, reflecting this. “Historically, we will react very quickly to trends,” Renwick said. The insurance industry has raised rates about 2.6 percent, Renwick said, while Progressive tried to anticipate future trends by going up 4 percent. “Others are now perhaps catching up,” he said. Progressive also wasn’t fazed by its claims severity, according to Renwick. “Our severity trends have been good as well,” he said. In fact, the company’s quarterly report indicates severity was better than expected, partly because of what Renwick said was better claims management on the bodily injury end of things. However, it also reported collision severity was up 6-7 percent, while Allstate reported an overall property damage severity — it doesn’t break out collision, annoyingly for us — of 3.7 percent. Bodily injury severity stayed flat, however, as Renwick indicated — and those claims can cost much more than a car. (After all, you can’t write a person off as a total loss.) For Allstate, they were up 0.6 percent. Still, Progressive has noted before that even though severity might increase with new safety features on cars raising the repair price tag, their ability to cut the number of accidents could still see Progressive coming out ahead on collision underwriting anyway. Part of Progressive’s advantage, according to Renwick, was its “early-look system at miles driven” with Snapshot, the telematics device now used by 2.5 million, though not all of them have an active chip. After six months, a user sends back the chip and Progressive recycles it; Renwick said at a certain data pool size, the benefit of what you’d learn from more data points doesn’t justify the cost. Allstate’s DriveWise and DriveSense have only been used by about 850,000 policyholders, giving Progressive a much better data set to play with. Progressive looks at about a million trips a day and has studied 13-15 billion miles driven. “We’re very comfortable that we’ve got that inside look,” he said. The product is now in 45 states. In some states, Progressive is testing a new program where Snapshot could raise a driver’s rates, and Renwick discussed the early findings on the webcast. About 60 percent of Snapshot customers have been able to keep their teaser discounts, and another 10 percent or so are still seeing lower rates than they would have without it, Renwick estimated. Telematics like Snapshot are fascinating and seem to be the future of car insurance in at least the near term. However, repairers should keep an eye on potential business trends stemming from the technology’s adoption, such as how drivers behave now that they know someone’s watching and whether bad drivers’ higher rates cause them to drop collision coverage. Progressive’s combined ratio, which measures premium revenues coming in to claims and other expenses paid out, stood at 92.5 the past quarter. A 100 designates an insurer is breaking even, anything lower is profit which can be invested until needed for claims, and anything higher is red ink. Companywide across all lines, Progressive wants to hit 96, for a 4 percent return excluding investments. Allstate wants to hit an underlying ratio of 89, which unlike the combined ratio excludes catastrophic claims and various accounting factors. Essentially, Progressive told investors to judge it on how the company’s bottom line stands after absorbing the costs of the unpredictable. Allstate believes it should be judged on how well it managed the things it could control. Both are fair arguments for investors weighing a company’s business sense; however, creditors won’t care you batted 1.000 on the things you could control if “black swan” events mean you can’t pay them. But despite Renwick’s discussion of raising rates in anticipation of future expenses, he said he might start cutting them to grow market share — particularly as rival Allstate is raising rates and cutting ad spending after a rough quarter. As long as the companywide combined ratio isn’t ahead of 96, lower profit margins to obtain customer volume (which can be bundled with home loans, a Progressive goal) are totally acceptable, Renwick said. “Those are tradeoffs that not only do we make, it’s sort of the heart and soul of what we say is the guiding principals of Progressive,” he said. Correction: An earlier version of this article incorrectly stated the number of states in which Snapshot is available. Progressive offers it in 45 states.